Royal House of Grace Ministries is a platform where members are allowed to use their God given gift and talents to bless the body of Christ. 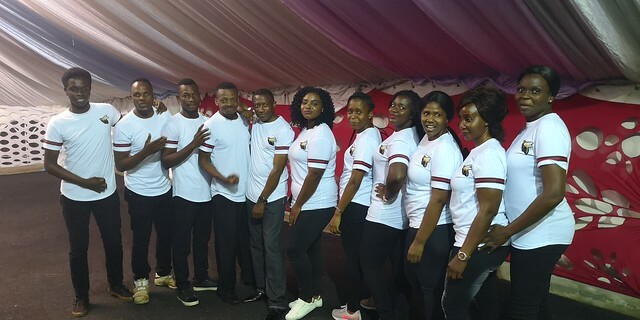 The worship team is one of such platform where the members use their gifts to usher the congregation into the presence of God for a life changing experience. Royal House of Grace Ministries is a place where we love to do things decently and in order as the word of God says. Since God is not the author of confusion, this department has been set up for ushering members of the church to maintain decency and order during services. This team ministers directly to our visiting guests. During special programs or events, they serve the visiting Pastors by providing their security, shuttling them to and from hotels, and to worship center. They also provide security backups and logistical support and cooperation to other departments. This department helps to clean up the church and it environs thereby making the church a serene place of worship. The cleanliness of the main auditorium, offices, and the rest rooms are under the watchful eyes of the members of this department. The church has different types of equipment which is always in use during service to enhance effective communication and ministration. The proper functioning and maintenance of these equipments is the responsibility of this department. The bible we read today is a product of scribes who wrote down what God was saying and doing. This department is saddled with the responsibility of documenting activities and events taking place in the church for reference purposes, publishing of our bulleting and making our business available on demands. The mission of the intercessory Department is to work behind the scenes to edify and cover the entire church through prayer; and to inspire and encourage the members, families and all church ministries to pursue a loving and deeper prayer life with God. This department is in charge of all the programs and events of the church. They carry our vision and make it become a reality. Events venues organization, program advertisement etc falls under this department. This department coordinates is in charge of day-to-day running of this ministry. They coordinate the activities of the various departments to ensure running and implementation of our vision and goals. They also manage our finances to ensure that our bills are paid and scholarship beneficiaries receive their money on time. The objective of the Media Department is to carry the Gospel of Jesus Christ to our visually-driven, ever-changing world through the use of technology and media, and to equip other ministries of the church to use digital and electronic media as a worship and outreach tool. By this we are aiming to enhance the worship experience, communicating with the congregation, extending the congregation beyond the walls of the church, and proliferating the message.